Bike infrastructure in the CRD is built in fits and starts, much of it done with grants from other levels of government. Usually these grants are announced with little background information about the projects and where they are in the region, or what has come before. Today’s ICBC announcement of funding around the CRD is case in point, the tweet shows a picture of Bay St at Chamber, with no mention of the additional bike lanes and other work the City of Victoria has done in recent years. 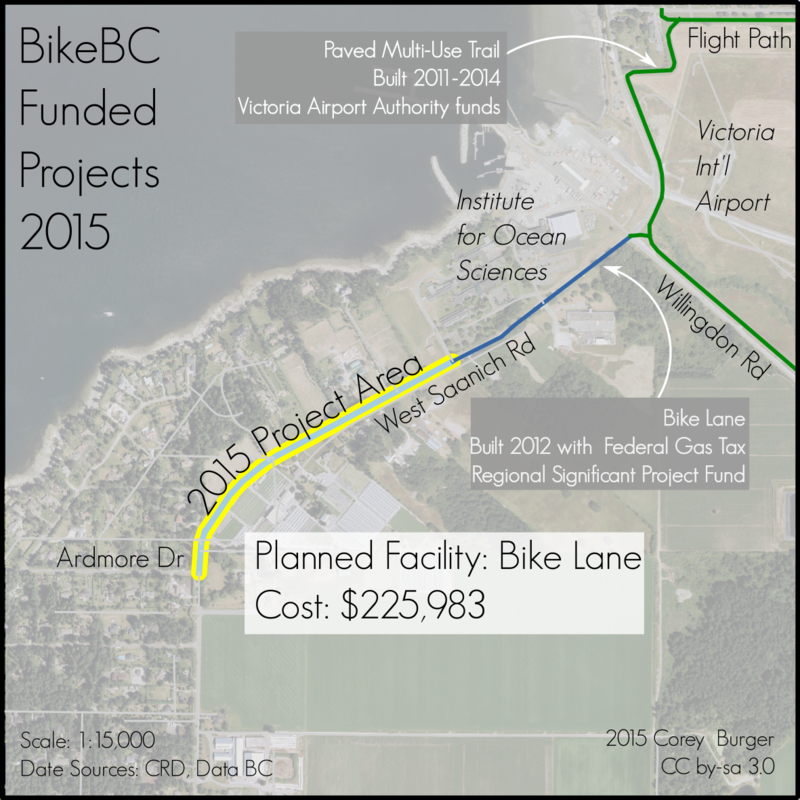 So I thought I would do up a few quick maps of the Ministry of Transportation & Infrastructure’s BikeBC Cycling Infrastructure Partnerships Program (CIPP) funding for 2015 in the CRD, to show how they fit into the larger regional picture. 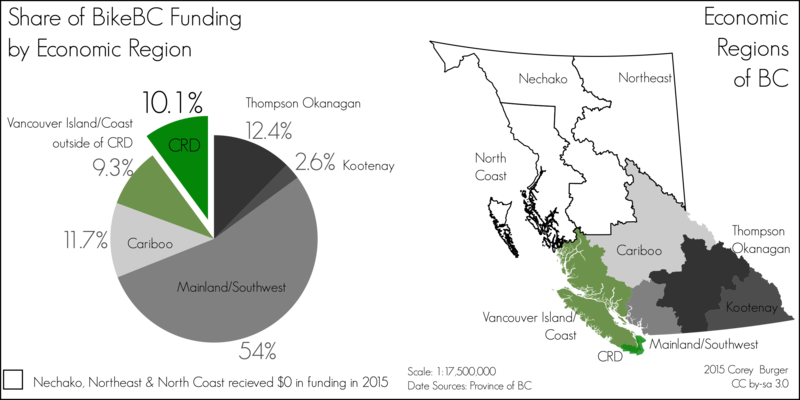 First, of the 20 projects throughout BC, how much of the funding went to each of the economic regions? When you slice up pie by population, you find that funding doesn’t fully match population, with the large projects in Kelowna skewing their percentage upwards, while Metro Vancouver and the Fraser Valley RD were much lower. The CRD does not badly, getting 10.1% of the funding despite being only 8.2% of the population (2011 numbers, Census Canada). Three municipalities received funding this round: North Saanich, Oak Bay and Sooke. All three could be described as gap-closing projects, connecting existing bike infrastructure better together, although the density of our bike network means that nearly all projects could be reasonably described as gap-closing. 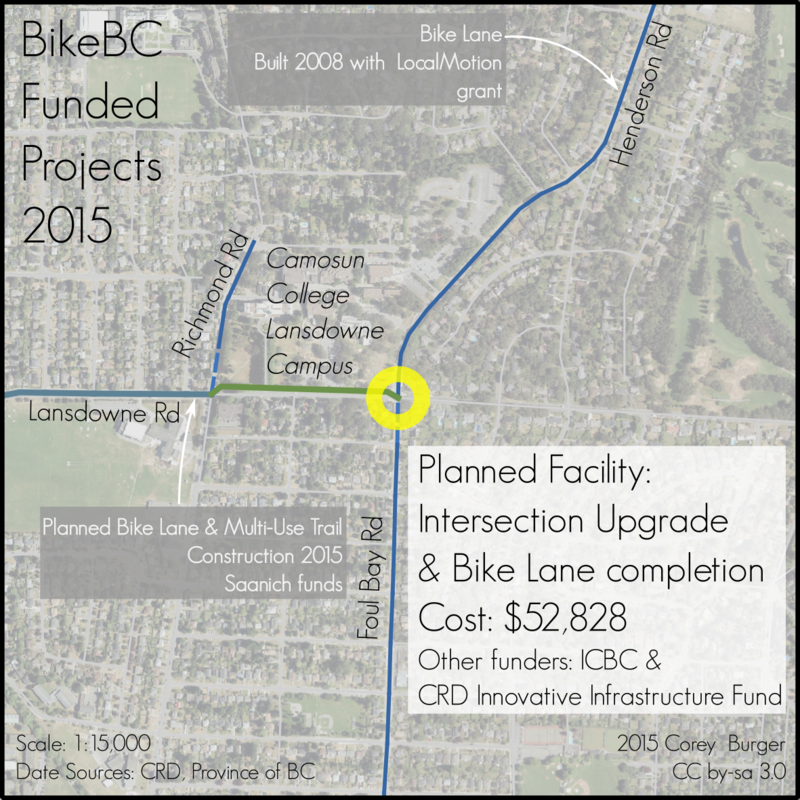 This bike lane project extends existing work on West Saanich Rd and helps like the Ardmore neighbourhood to the airport Flight Path. North Saanich has been looking for funding for this section for some time, after being turned down for Regional Significant Project Funds in 2014. Helping close the gap between Oak Bay and UVic up the Foul Bay/Henderson corridor, this project is actually a joint Oak Bay/Saanich project, as it ties together the work that Saanich will be doing further west in 2015 on Lansdowne and Camosun College. The reason this was a sole Oak Bay project as although Foul Bay straddles the border, Oak Bay is responsible for the entire roadway for Foul Bay Rd to the Saanich border (although Saanich is responsible for the curb, gutter and sidewalk). This doesn’t fully close the gap up Foul Bay hill, as there is still a short section of bike lane to be finished between Middowne and Lansdowne. The need for a connection from the Galloping Goose Regional Trail to Sooke has been long requred, something Sooke has looked into for years, with a long-term plan to connect via a bridge over the Sooke River (PDF). 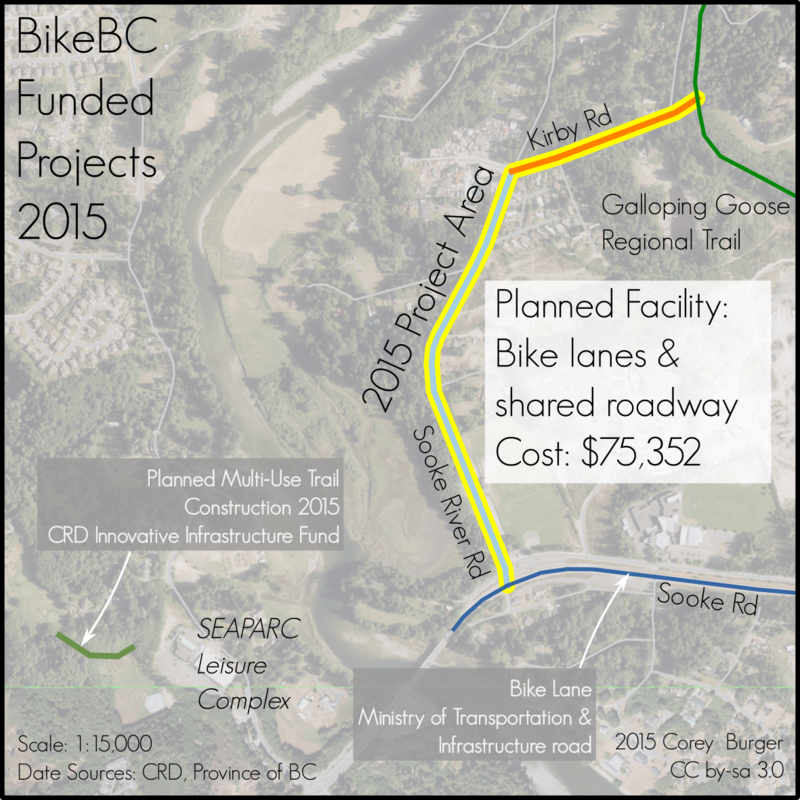 For the immediate future, this bike lane down Sooke River Road will help connect the Goose better to downtown Sooke, for tourists and visitors alike.